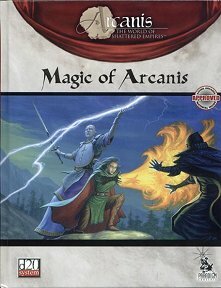 All you need to create magic-using characters in Arcanis. Publisher's blurb: "Any man can learn to fight, but only the gifted can harness the raw potential of creation. Those gifted with eldritch power bear the mark of something more. Whether taught the divine rituals of the Gods or working ancient arcane sorceries learned over millennia, the power of creation is in your grasp! "This book is a comprehensive guide to making spellcasting adventurers native to Arcanis. Every facet of the eldritch arts is explored, from classes, feats, spells, and the organizations that teach and protect mages or guide the divinely called in service to their God to the materials needed to forge mighty items of power. Such power is needed, as the enemies of the Gods and the dreaded Harvesters of Ymandragore lay in wait for the unwary."